At Edmentum, we’re committed to giving back to our local communities. Our Volunteer Time Off (VTO) program gives every team member two work days off per year to give back to schools and other local nonprofit organizations. We love being able to see the impact that our team members have on the places where they live! I completed my first day of VTO at the high school my 14-year-old son attends in Southwest Wisconsin. Because I’m a former band teacher, I opted to assist the band teacher. This is the district I taught in until I finally left teaching 10 years ago, so I knew nearly every staff member there, which made for a fun little “homecoming.” Everyone I talked to thought it was “super cool” and “amazing” that my company provides volunteer days—they LOVED that! First thing in the morning was the jazz rehearsal for the Big Band Bash (BBB). This is the 13th annual BBB event, where students put on a big evening concert with refreshments and dancing. Everyone who attends dresses formally, and after the high school jazz band plays, a professional jazz group performs for the rest of the evening. Because I was there to help, the band teacher broke out the students into sectionals to work on the more challenging pieces. I worked with the entire saxophone section and had a BLAST. It was really fun digging into a piece of music again with such amazing and dedicated student musicians—and they made some great progress! 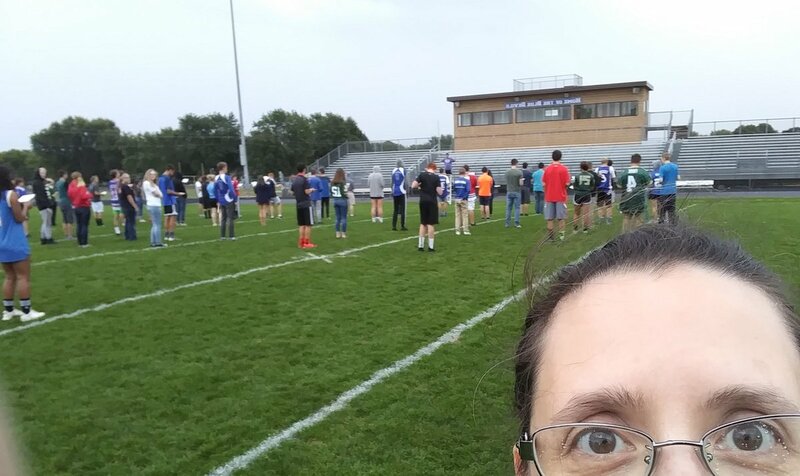 After jazz, we had a combined Symphonic Band and Wind Ensemble marching band rehearsal to get ready for homecoming that Friday. This probably included 110 to 120 kids total, and again, the band teacher broke out the group into sectionals. I had a lot of fun working with the percussionists, who were focusing on a complicated new cadence that was actually composed by five of the percussionists in the room! Once we finished that, the teacher opted to have everyone go out to the field without instruments to work on the blocking and—get this—to SING their parts as they marched. You’ve not lived until you’ve heard the 1980’s hit “Danger Zone” sung by 120 high school kids. After lunch, while the band teacher was giving private lessons, I spent my time inputting original music that students in one of her previous music theory classes had composed into a program called Finale. This is a tedious process—you need to enter every note, rhythm, articulation, dynamic, tempo marking, etc., one at a time, but I managed to get every single one done, saving her a ton of time. All in all, it was great to see old colleagues and have the chance to teach again. I can’t wait to be able to do it again soon! As a student, I had many opportunities to make music part of my life. After getting started in elementary school, I played the cello through high school and the flute through college. I made some amazing friends along the way and played some beautiful music in some incredible places, and I still use the skills I learned. As an adult, I know how much music education enriches the lives of young people. SOUNDS (Students Opening Up New Doors with Strings) Academy is a nonprofit music education organization that teaches, mentors, and provides musical experiences and opportunities for underserved youth in schools across the Phoenix area. 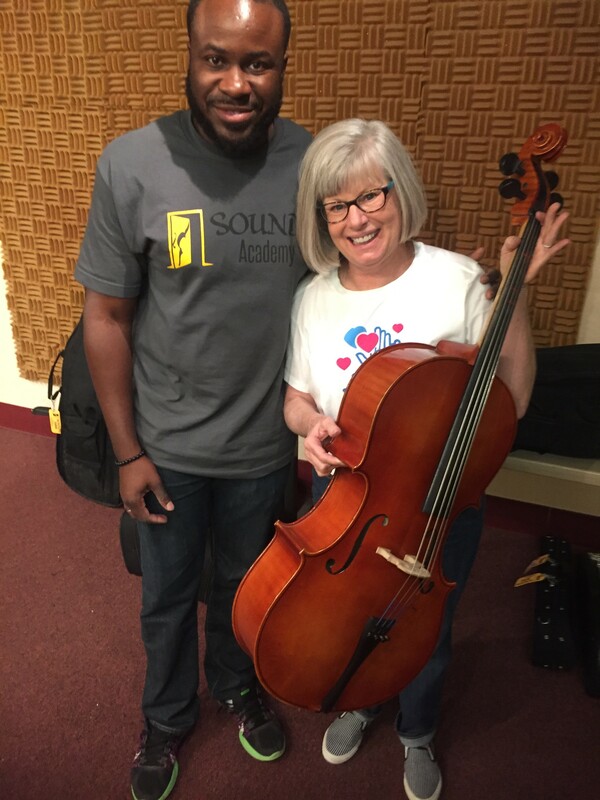 VTO allowed me to spend a day with Kirk Johnson, the founder of SOUNDS Academy. A musician, youth orchestra leader, and former classroom teacher, Kirk believes that all children deserve access to music education. I was delighted to use my volunteer hours in support of something I believe as well. I helped clean and inventory stringed instruments so that they would be ready to check out to students in this year’s program. I was amazed at all the violins, violas, and cellos that would be provided to students who otherwise wouldn’t have a chance to experience the joy that playing a musical instrument can bring. As I examined, then polished, then ran the bow across the strings of each one, I was taken back to my time in elementary school. I am so thankful for not only the privilege of learning to play the cello years ago but also for the honor of playing a tiny part in the future of another elementary student who will learn to play the cello now too. I am overjoyed to think that there’s a 4th grader somewhere in Phoenix who may be as happy about a cello as me. I’ve been using my VTO time to volunteer weekly as a coach for a school-based Girls on the Run team. Girls on the Run is a nonprofit program dedicated to supporting girls to recognize their inner strength and celebrate what makes them unique. 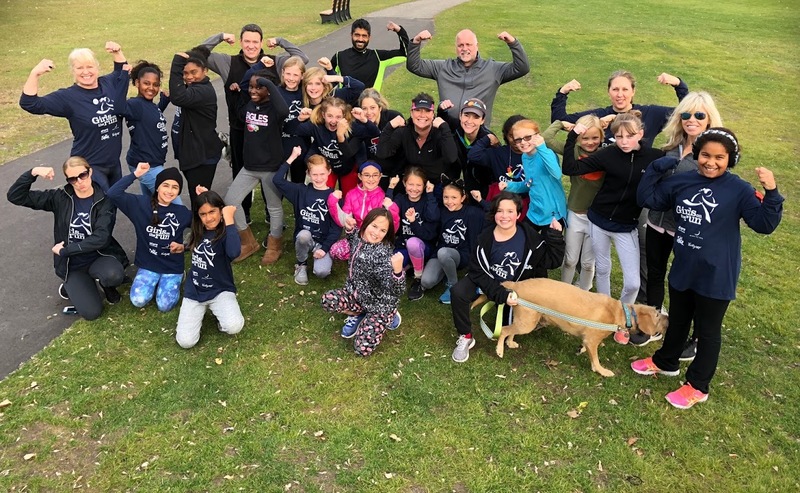 At Edmentum, we’ve recently been putting a lot of focus on social and emotional learning, so Girls on the Run is a great fit. The basic program is that each team, run by trained and volunteer coaches like me, meets two times a week for a 10-week season. Our team consisted of 20 girls in grades 3–5, and we were based out of a local Minnesota elementary school. Each day that we would meet, the coaches delivered evidence-based curriculum around topics like understanding ourselves, handling emotions, and building positive relationships. This curriculum is the heart of the program, but it is delivered through running as a way to inspire and motivate girls. So, each day that we would meet, the lessons of the day were supported and affirmed with specially designed activities and running practice. At the end of each season, teams from all over the Twin Cities meet for a joyful and powerful 5K, where hundreds of girls run together, along with a supportive adult and with spectators cheering them on. We just had our 5K on a recent Saturday, and even though the starting temperature was around 15 degrees, we had a great time, with lots of hugs and laughs. I love that Edmentum is supporting my volunteer relationship with Girls on the Run. In my role in Edmentum’s marketing department, I spend my time trying to put myself in the shoes of educators and students, understanding their needs and creating resources they will find useful. But, all the time in the world perusing education news and research, checking out teacher podcasts, and tuning in to live webinars doesn’t come close to providing the same insight that comes from spending just a few hours in the classroom with teachers and students. That’s why I was so excited to have two different opportunities recently to volunteer at Edmentum partner school Carver Elementary in Carver, Minnesota. During my experiences operating the parent information station on kindergarten and 1st grade assessment day and later helping 3rd to 5th grade students get acquainted with Study Island, I was reminded of how many demands educators are asked to juggle on a daily basis and how gracefully they manage it all. Helping out on the assessment day illustrated the careful coordination of limited resources that it takes to keep a school running smoothly. Assisting with Study Island orientation was a lesson in the vastly diverse needs of students, the importance of meeting each student where he or she is, and the irreplaceable role of educators in making that kind of personalization possible. In my handful of hours volunteering at Carver Elementary, I hope that I was able to make an impact by alleviating a small bit of the time-crunch pressure that educators consistently work under, and helping the students I interacted with get off to a positive start with Study Island. Those educators and students certainly left an impact on me, and I walked out of Carver Elementary very proud to work for a company that supports the important work of teaching and learning. We are so thankful that our team members value giving back to local communities, and we look forward to sharing more of their experiences with you! Interested in hearing more stories of positive impact? Follow #EducatorFirst on Twitter for an inside look at what the Edmentum team is up to!